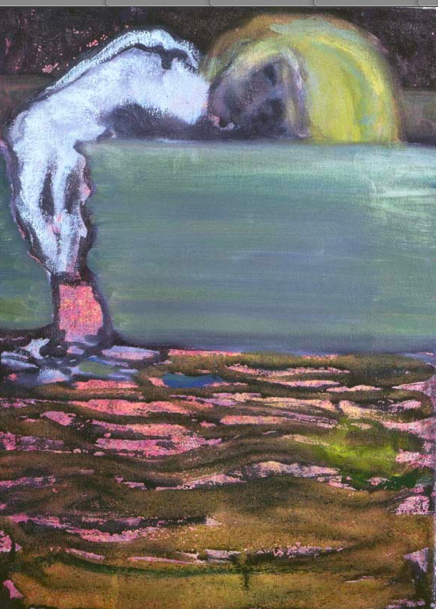 Furthering the topic of women in horror film as it extends into contemporary art is a discussion on Friday the 13th’s main character Alice in the work of Peter Doig and Ben Rivers. As artists both Doig and Rivers touch upon the famous horror heroine’s status as the ultimate slasher ‘Final Girl’ who Carol Clover describes as, ‘…intelligent, watchful, level headed; the first character to sense something amiss…the only one, in other words, whose perspective approaches our own privileged understanding of the situation’ (Clover 1987, 79). As our portal into the action and into narrative meaning, she is the character with whom the audience most identifies because we have shared in her suffering and she, like us, remains alive. Dead (Rami, 1981), Cabin Fever (Roth, 2002), and The Strangers (Bertino, 2008) are but a few examples. The woods themselves are generally areas of the unknown and produce fear in imagining what kind of people inhabit them. Equally Doig’s Hitch Hiker (1989-90) contains an aimless sense of unease and feelings of solitude, calling to mind The Hitcher (Harmon, 1986) and Steven Spielberg’s Duel (1971). What connects a seemingly miscast Doig to horror cinema is the incredible spatiality created between the captured in-between moment and the conflated relationship between the audience and the scene. 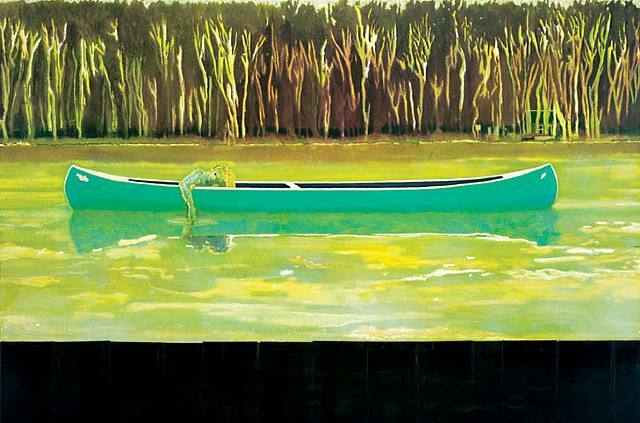 Peter Doig encapsulates the entirety of meaning into one image in his works inspired by the camp-counselor killing classic, Friday the 13th. Formally he uses paint to construct this insertive space with linear divisions on the canvas, compiling multiple layers of memories and stories. This reflective image becomes the area where the viewer can insert him/herself and his/her stories into the picture. Specifically in Echo Lake and Canoe Lake he delineates the crucial point in Friday the 13th when what appears to be resolved is anything but. 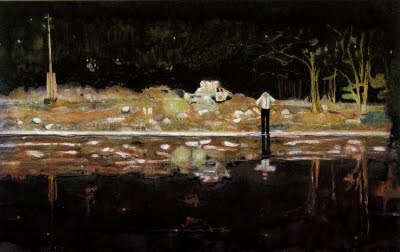 With these paintings he creates alternate points of view: in Canoe Lake we look onto Alice safely in her canoe but in Echo Lake are viewpoint is through Alice’s eyes, looking onto the policemen on the shore. Viewed in relation to each other, this is similar to different cuts used in film where the audience is simultaneously the eyes of the killer, the victim, and the outsider. Importantly with Doig, who may or may not intend to completely tell the heroine Alice’s tale, he never privileges the audience with resulting action. Instead, he evokes her storyline as a device to hold all tension. By never moving forward or backwards, the girl and the audience are forever held in to this singular moment. It is a beautifully evocative way to frame anticipation and anxiety that will never be released.